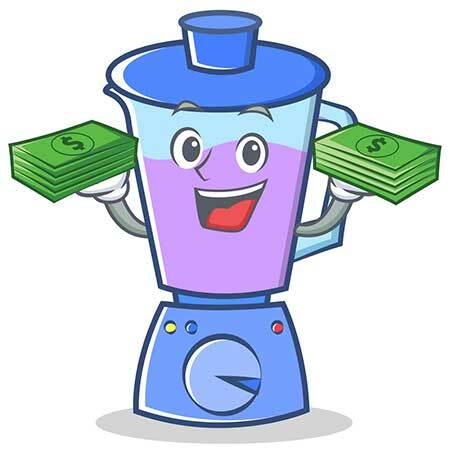 Are you looking for a great blender but horrified by how much a Vitamix costs? I don’t blame you, over $500 is a lot to pay for a blender if you’re not a professional chef, and I’m pretty sure it’s a lot even if you are! Luckily that’s not the only way to go, there are loads of great blenders that cost under $100 so you can get great blending power even if you’re on a budget. And whether you want to make smoothies on the go or you’re more interested in blending up soups I’ve found the blender for you. So read on and I’ll take you through everything you need to know about buying yours and then a review of some of my favourite blenders under $100. Normal blenders are the ones with the big jug that sits on top while personal blenders are the individual cup ones that you can turn around and put a lid on. Both have their uses and I’m going to take a quick look at what those are. Pros Usually more powerful, they’ve got bigger capacity jug that sits on top compared to a personal blender and they can blend pretty much anything. Ideal for soups and larger batches of smoothies. Cons can be difficult to clean even when they’re dishwasher safe as they’re quite bulky and take up a lot of room. personal blenders are the ones that blend right into the drinking container, NutriBullet is probably the best known personal blender. Really handy to make drinks and take them on the go, good for single servings too but not so useful if you have a whole family to cater for. Pros super convenient because you drink out of the container that you blend in, plus they’re very easy to clean because the blade is a separate piece that you can easily get in and around with a sponge. Ideal for single use smoothies and drinks. Cons Not as big if you want to make big batches of drinks for a whole family say. Similar to what I was saying before what you’re wanting your blender to do will dictate which type you get. So if you want it to do a little bit of everything then a normal blender will be the way to go but if you’re wanting it just to make smoothies then you’ll get on fine with a personal blender. Depending how much space you have in your kitchen you might be better with a personal blender because they don’t take up as much space. I like my blender to be able to do a little bit of everything whether it’s making juice, smoothies or blending up soups. My personal favourite is a powerful personal blender that you can do soups in batches but also makeup smoothies nice and easily, added bonus that a good one is far cheaper than a good normal blender. They are cheaper so don’t have quite the same capabilities of more expensive models but there only real place this comes up is if you want to make green juice. Whizzing up greens like kale with very hard stalks takes a lot of power if you want it smooth, all the blenders here will manage to blend it but it’s going to be a little bit chunky still. The same goes with making purees, for under $100 you just don’t quite get enough power. These are all available at Amazon so just click the Price & Reviews at Amazon button and you’ll be taken there where you can read some more reviews and order yours today. 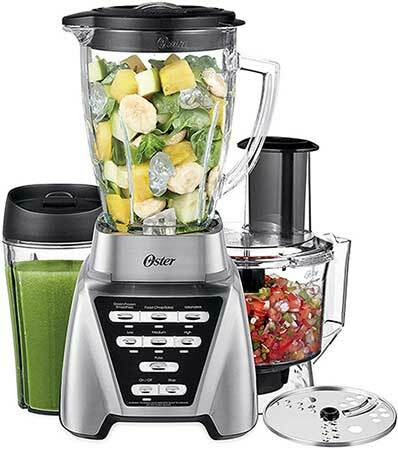 This Oster blender has everything you could need, a big glass jug to blend in, a portable 24 oz cup alongside and a food processor attachment. All for under $100! The 7 setting include 3 different speed settings – high, low, medium – and three pre-programmed settings for specific uses – green/frozen smoothies, food chop and milkshakes – so you can blend pretty much anything you need to, I still wouldn’t trust the green shakes for hard greens like kale stalks but 1200 watts will let it handle everything else. Oh, and the 7th setting is pulse for those wondering! The main jar you blend in is made of glass and holds about 50 oz while the plastic cup that comes with it is also a great size at 24 oz, you can’t blend straight into the cup but it’s still handy to have. The food processor also offers that little bit more versatility to it allowing you to make even more delicious things in the kitchen. The base is made of plastic and “brushed with chrome” to make it look metal, but they have to keep costs down somewhere and that seems the obvious place to do it. Besides it still feels nice and sturdy. The final victory is that the glass jug is dishwasher safe! It’s not outrageous to clean because it’s nice and big but having it in the dishwasher just makes it that little bit easier. Overall a standup choice for the best cheap blender, it can handle everything you could need it to, feels sturdy and will make a mean smoothie. Can’t have an article on cheap blenders without talking about the Nutribullet! It’s an industry standard and for good reason, it makes delicious smoothies anytime and anyplace and you can just flip them into the cup and go! It’s got two blade attachments an extractor blade and a milling blade, this just adds an extra layer to it because it lets you grind up dry seeds and grains into powders and you could even use it to grind up coffee beans. Meanwhile, the nutrition extractor is the exciting part that turns a cup full of fruit into a delicious smoothie. And it comes with 3 different cups so you can use the same base to make multiple smoothies, you just have to rinse off the blades in between uses. This makes it great for family use or if there are more than one of you in the house who like a smoothie in the morning. The cups are nice and wide so they’re easy to get into and clean but they’re also dishwasher safe so you can just put them in on the top shelf and hey presto you’re ready to go the next morning. If you’re on the go a lot and need a delicious and healthy drink to go out with you in the morning then this is the blender for you. Another top of the range budget blender featuring three power settings – low, medium, high – that also has an enormous 72 oz capacity! So you can make enough smoothie in the morning for you, your partner, your kids, your dog and your neighbour. Ok maybe not your neighbour too but there will definitely be enough for the whole family. And it makes short work of ice so you can make frozen margaritas! The blades on the Ninja are very sharp but do start to wear down if you use it very often, for instance, daily use will result in it starting to lose its smooth quality after about 6 months but for the occasional use the ninja will last you really well. What it is, is very easy to clean, because the blades are split over multiple levels and left out rather than being stuck to the bottom it’s really easy to clean around. Just be careful because like I said the blades are very sharp so you’ll need to be careful! Alternatively, you can put it in the dishwasher, of course, it’s all BPA free plastic that’s dishwasher safe. For the money it’s a great blender, can handle pretty much anything except prolonged daily use. I know the color shouldn’t matter but it just does OK? I have a very specific color scheme in my kitchen and have bought all my small appliances to match it, don’t judge me! So the fact this comes in over 20 different colours is a huge plus. But if you’re also interested in whether it’s a good blender you’ll be pleased to hear it is! Despite the low power it seems to do a great job at blending pretty much anything, it can handle ice and frozen fruit and even has a setting for chop for cutting up vegetables. The five speeds are: stir, chop, mix, puree, liquify, now liquify is not as menacing as it first sounds, they are all just settings of gradually increasing speed with 1 being the lowest and 5 being the highest. And of course, there is a pulse button. What’s really cool is the bit of tech involved called the intelli-speed system, this senses what the contents in the jug are and adjusts the speed accordingly so you get the perfect blend every time. And while we’re on the jug it’s a really good size at 60 oz and made from BPA Free plastic. 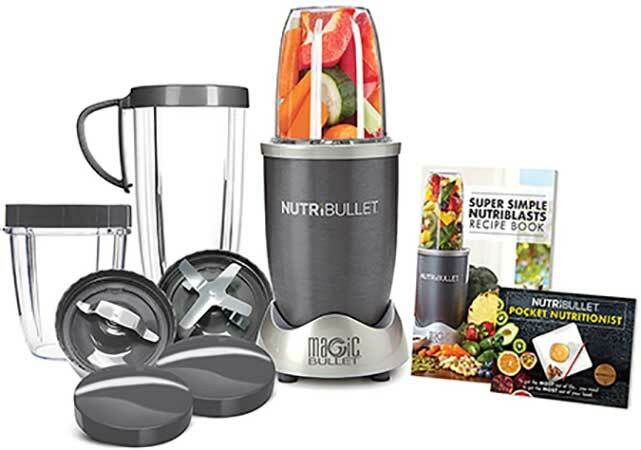 Overall a great blender that has just recently come down in price to below $100, powerful enough to take down ice and smart enough not to over blend, a pretty cool combo! The Wave Crusher! Pretty cool name right? Well apart from having a cool name it also blends pretty well too, it’s even on the ultra-cheap side being under $50 but with that, you definitely get what you pay for. The jug is 40 oz so on the smaller size for a standard and there are 8 speed settings including a high and a low pulse so you can get the blending power you need. But the power is a little lacklustre compared to some of the other blenders on here, you’ll be able to make fruit smoothies with soft fruits but it won’t handle ice or frozen fruit very well. The bonus to the 40 oz storage is that it’s that little bit easier to store because you don’t have to find cupboard space for a big jug. I would only recommend this one if you’re on a really tight budget and don’t mind the extra hassle because you might find yourself having to open it up push down what you’re blending towards the blade, unless you’re making smaller quantities. So an average blender but at a very low price, it will still blend which is all we really want. Where is the best place to buy a cheap blender? I like Amazon, purely because it’s easy, free delivery, and you can have it super quick, plus they have a good returns policy and the most choice. Otherwise, you can sometimes find good deals at Walmart . Will these work for protein shakes? They certainly will! Every blender head can handle a protein shake no problem at all but you might want to check out my other article on the best blenders for protein shakes for more information. What do I need to make green smoothies? Oster at the top will manage a green smoothie it just might be a little chunky, if you want to make really smooth green drinks then you’ll need a more powerful smoothie maker or even a juicer.